Mountain Aire Golf Club has two great stay and play packages to offer that will fit the needs of any golfer. We have a package with the Hampton Inn of West Jefferson which includes a discounted hotel stay, a discounted 18 hole round of golf, and a free sleeve of golf balls. The package cost is $139 per room for one person or $175 per room for two people on the weekdays (Monday - Friday). The cost for a weekend (Saturday or Sunday) trip will be $179 per room for one person or $209 per room for two people. Our next option is with Nations Inn of West Jefferson. This package also includes a discounted hotel stay and a discounted 18 hole round of golf. The package is for 2 adults per room and golf for only $165, Monday through Sunday. 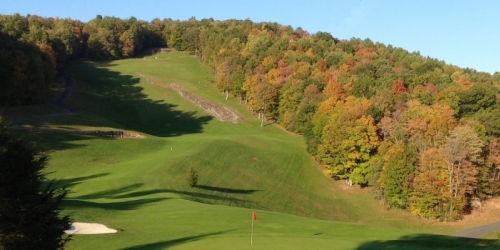 Visit the mountains of North Carolina and enjoy a great hotel stay packaged with a spectacular round of golf. These packages are only available during our season which runs from March through November. Call the Hampton Inn of West Jefferson at 336-846-4000 or Nations Inn of West Jefferson at 336-246-2080 to book your stay or you can also click the links below for the hotel of your choice. Mountain Aire Golf Club reserves the right to change price and offer at anytime. Prices and offer are subject to change without notice. NCGolf.com is not responsible for errors posted in this golf package.